Cat’s in the Kitchen opened for business in 1990. The store is just a mile from the north end of Canandaigua Lake in the scenic Finger Lakes Region of New York State. 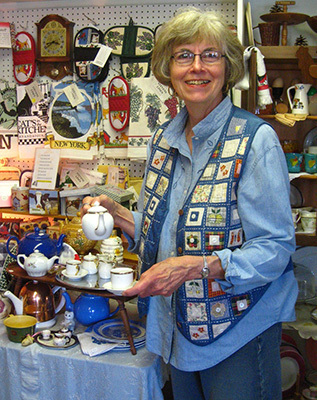 Cat’s in the Kitchen was inspired by two other family businesses which for decades offered an enticing combination of antiques, collectibles, and gifts. My aunt opened and operated the 1812 Country Store in Hemlock, NY, until 1985. The Emporium in Essex, NY, was established and run by my sister and her family for over twenty years. Since we first opened our doors, we have been a member of the Canandaigua Chamber of Commerce. www.canandaiguachamber.com. Other antique stores and a vibrant downtown shopping district are within a short drive of the shop. Every February Cat’s in the Kitchen also has a booth at the Canandaigua Classic Antique Show and Sale in nearby Farmington, NY: www.canandaiguaantiquesclassic.org.